Although best known today for his paintings, it was through his graphic works that Edvard Munch made his international name. 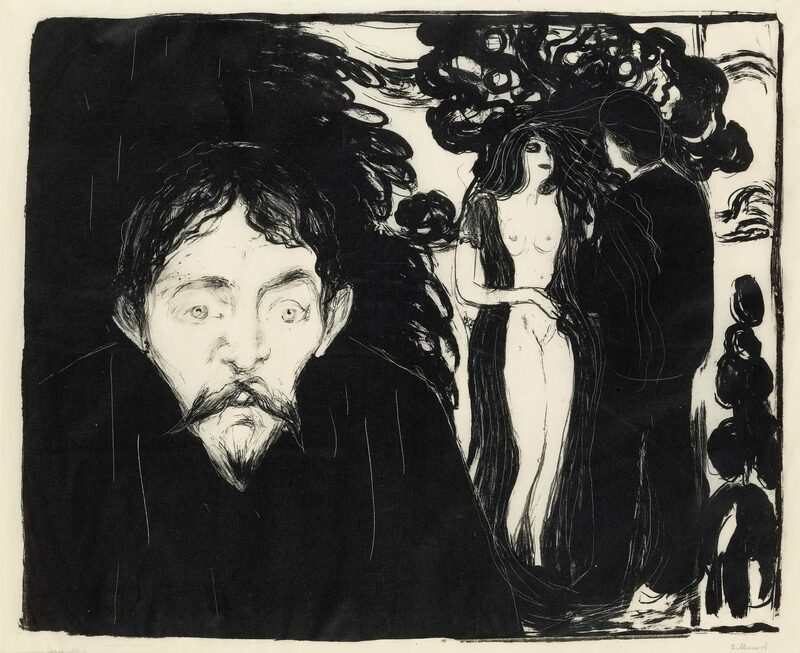 This exhibition at the British Museum, London – the largest of his prints in 45 years and compiled in collaboration with Norway’s Munch Museum – brings together some of his most iconic images, and reunites a number of prints with their matrices, elucidating the various processes involved in their making. Norwegian Arts looks at the artist’s experimental use of lithography, etching and woodcut. Norwegian artist Edvard Munch’s inscription at the foot of an 1896 black-and-white lithographic print of his iconic painting The Scream (1893) – “I felt the great scream throughout nature” – is almost as soul-wrenching and shudder-inducing as the world-famous image itself. 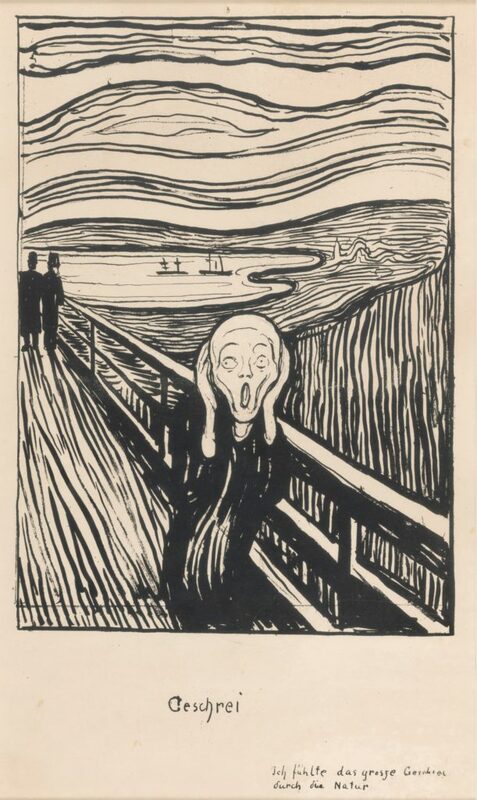 According to Giulia Bartrum, the curator of the British Museum’s forthcoming exhibition, Edvard Munch: love and angst, the wide-mouthed figure shown covering his or her ears, long assumed to be screaming, might, in fact, be hearing the scream rather than uttering it. The full title of the work, The Scream of Nature, similarly supports this standpoint. Either way, the very fact that such discussion is still ongoing, 126 years after the painting of the picture, shows the enduring appeal and intrigue of the Symbolist artist’s work. This lithograph will be one of more than 80 works on display, primarily comprising prints, from the period between 1894, when Munch first began experimenting with graphic media, and the first decade of the 20th century. During this time, Munch travelled a lot between Kristiania (modern-day Oslo), Paris and Berlin. It was in Berlin that he made his first print, aged 30. Born in 1863 in Adalsbruk, Munch grew up in Kristiania. His early years were plagued with illness (both his own and that of others) and death, losing his mother and favourite sister to tuberculosis before the age of 15. Another sister was later diagnosed with schizophrenia, and his own mental health was never robust, with diagnoses, both during his lifetime and posthumously, variously including depression, anxiety and bipolar disorder. “The angels of fear, sorrow, and death stood by my side since the day I was born,” he wrote, following his father’s death in 1889. When Munch moved to Germany in 1892, his focus on death shifted somewhat to an expression of anxiety – with The Scream, painted a year later, being a case in point. Munch had already been practising as a painter for a decade by this point, producing some 60 paintings, but without really becoming well known outside Norway. The closure of his first exhibition in Berlin, in 1892, after just one week, due to societal disapproval, had the contrary effect, however, of bringing his work to the attention of a younger generation of avant-garde artists and collectors. While not an astute businessman, Munch wanted his works to be disseminated, to be seen, and to become known – preferably without his having to part with the paintings themselves, which he described as his ‘children’ – and he was fully aware of the commercial potential of the print media. Graphic works were becoming increasingly popular – and increasingly collectible – and Berlin, along with Paris, was at the cutting edge of these new techniques. Munch thus began to experiment, exploiting them to their full, and his international reputation really grew from this point on. Edvard Munch (1863-1944). Self-Portrait, 1895. © The Trustees of the British Museum. 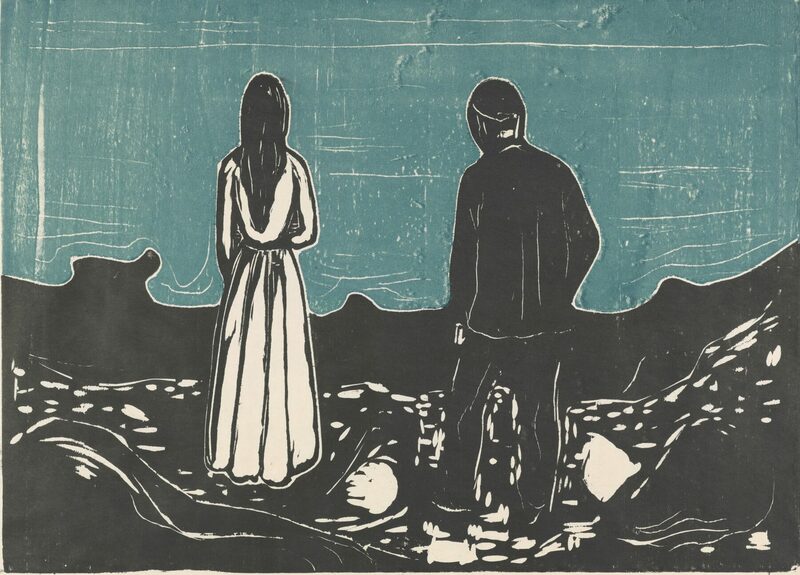 In addition, printing offered Munch the opportunity to further explore some of his leitmotif themes using varying techniques to different – and often very striking – effect. He often, for example, reworked and reprised elements first explored in a graphic medium in a later painting, but also vice versa, as with The Scream. The Sick Child (1886), which dealt with the death of his sister Sophie many years earlier, likewise gave rise to a series of prints: one set repeating the painted composition; a second focusing in on Sophie’s head on the pillow, examining close-up details of her face and stirring up significant emotion. While his paintings were perhaps bigger and grander, his prints were certainly more accessible and brought his often dark subjects – death, addiction, sickness, suicide, anxiety – to the collectors’ market. Munch took no instruction in any form of printmaking, but watched and learned from the technicians themselves. It was new for him to work in dialogue with someone else. He also experimented alone, however. For example, he made a number of woodcuts for which he chopped up the block with a fretsaw, inked each segment separately, and then fitted them back together like a jigsaw puzzle. In this way, he avoided any overlay of ink, and, in prints such as Moonlight I (1896) and Two Human Beings. The Lonely Ones (1899), the white lines separating the figures from their ground – as well as from each other – serve to intensify the sense of isolation. In Man’s Head in Woman’s Hair (1896), the technique likewise achieves a tension between the unity sought by the woman’s hair wrapping around the man’s face, and the disunity created by the stark colour contrast and dividing lines, from where the blocks have been cut and inked separately. Paradoxically, however, Munch also sometimes used the woodcut medium to emphasise a sense of togetherness and unification, by incorporating the wood grain into his compositions. A good example of this is The Kiss IV (1902), where the couple kissing are also brought closer together by the grain, becoming one through the underlying pattern of the wood. The Lonely Ones, 1899. Edvard Munch (1863-1944), Munchmuseet. For his lithographs, Munch worked uniquely, placing his stone – about half the size of a pillow (but obviously much heavier) – on his easel, like a canvas, on which to draw his image in an oily medium. The actual process of printing, requiring treatment of the stone with acid resist, would have been carried out by a printer, however, but, unlike many artists, Munch tended to be present, giving instructions as to which colours to use and in what order. He once described his pictures as his diaries and is said to have sent the final stone for a portrait of his close friend Eva Mudocci to her with a note attached reading: ‘Here comes the stone that fell from my heart’. Likewise, when it came to etching, he would take the portable copper and zinc plates around with him to cafes, something like a metallic sketchpad, so surely these images, made in haste and with an indubitable level of spontaneity, must be incredibly expressive of his inner state. Although he did work with colour, Munch was also very fond of the intense black that could be achieved through printmaking. “The greatest colour is black, the most essential colour. It is the tabula rasa for pure expression,” he once wrote. This idea was also very fashionable with artists in Paris at the time – including the likes of Eugène Carrière, Paul Gauguin, and Odilon Redon – and their works are also explored in this exhibition, which seeks to paint (or print) a picture of the international stage on which Munch was working. 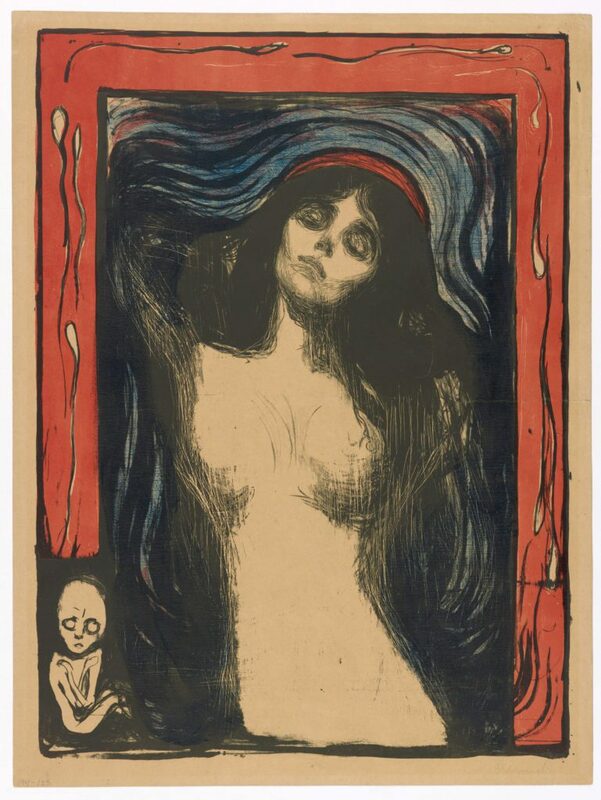 Munch continued making prints throughout his life, particularly lithographs, although he later worked more on transfer paper, from which the design could be easily copied on to stone. His corpus of graphic works numbers close to 600 different prints. Extraordinarily, he was very careful to keep track not just of these, but also of his matrices (the plates, stones and woodblocks from which they were made). Before the First World War, they moved around Europe a lot, between Berlin and Paris, but after the outbreak of war, when Munch himself was back in Kristiania, he tried to bring as many as possible of his matrices ‘home’ as well. There are many anxious letters in his archive, requesting their return from the printers. Those for The Scream and The Sick Child sadly weren’t kept – either through being lost in transit or storage, or perhaps being sold or given to the printer, as was more common at the time, since they were seen merely as a means to an end. This exhibition, however, offers a rare opportunity to enjoy some final prints alongside their matrices – examples being Vampire II and Madonna (1895/1902), which were made on either side of one and the same lithographic stone; the copperplate and finished etching of Kristiania Bohemians II (1895); and the birch woodblock for and two prints of Head by Head (1905). The hope is that by seeing the matrix itself, visitors will get something of a better understanding of and appreciation for the processes involved and the techniques that Munch learned and developed – both as a means to an end, but also perhaps as ends in and of themselves. Madonna, 1895/1902. Edvard Munch (1863-1944), Munchmuseet. Munch wrote: “My intention in working with graphics was to bring my art into many homes”. And he succeeded – both through wider dissemination to collectors during his lifetime, but also by leaving behind a legacy of some of the most frequently reproduced and widely shared images – in books, on posters, as various forms of merchandise, and on social media – an artist has ever made. 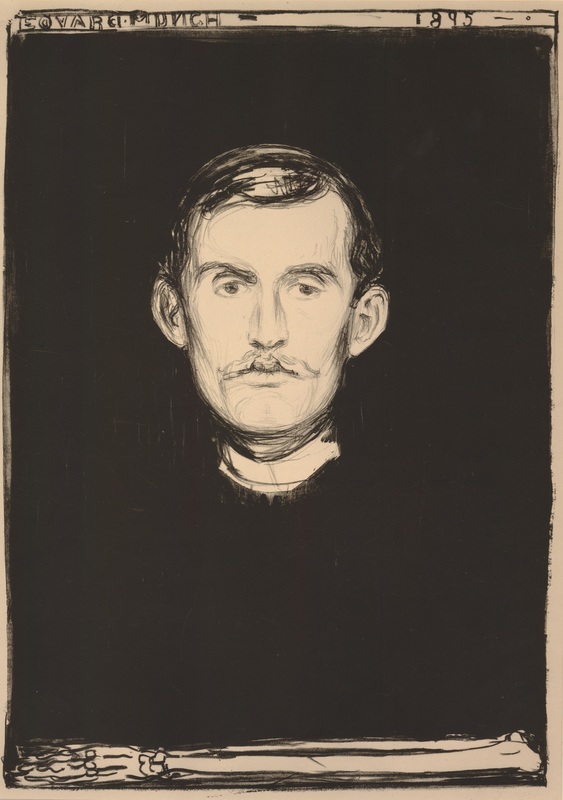 The exhibition Edvard Munch: love and angst will be on from 11 April – 21 July at the British Museum in London. Buy tickets here. Top photo: Head by Head, 1905. Edvard Munch (1863-1944), Munchmuseet.